Camper Travel Information can be found here. Our camp sessions begin and end on Mondays. This is an intentional choice on our part; while we recognize that means taking time off from work for many of our parents, it also ensures that the Catalina Express boat terminal is less crowded. Check in for campers headed to camp begins at 3:00 PM. Campers return to San Pedro at approximately 12:00 noon. Campers travel to and from San Pedro to Catalina Island Camps aboard the Catalina Express. Our boat departs from San Pedro. 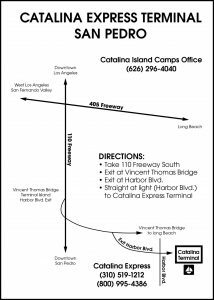 Here is a map to the San Pedro Terminal of the Catalina Express. Look for the Catalina Island Camps banner when you pull alongside the terminal. Our Counselors-in-Training will be curbside to assist with your luggage. Campers and their parents will be directed to the check-in table where they will be given a nametag and escorted to their counselor and cabin group. Any campers with medications will also need to visit the nurses table to check in those medications.